A thorough repudiation of the (Un) Affordable Care Act comes from, of all places, state-run National Public Radio. Timed to be buried by Super Tuesday coverage, NPR this week released a new study that indicates ObamaCare has failed on almost all levels. The poll, by NPR, the Robert Wood Johnson Foundation, and the Harvard T.H. Chan School of Public Health, shows that three-quarters of Americans think health care in their state has not improved under ObamaCare. The survey says more people think health care has gotten worse (26%) than better (15%). 49% of people think health care has stayed about the same. And I hope you haven’t been making plans of what to do with that $2,500 a year you’d be saving on premiums. The NPR poll confirms that was just another in Obama’s litany of lies. 45% of respondents said their premiums had gone up, while 46% said their premiums had stayed about the same. 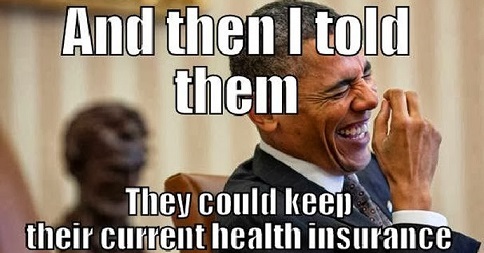 Only 4% said their premiums had actually gone down, as Obama promised they would. Along with higher premiums, copays and deductibles have gone up for 35% of people. 56% say they’ve stayed about the same. Again, only 4% of those surveyed said their copays and deductibles have actually gone down. Meanwhile, the increased benefits Obama swore we’d get apparently haven’t materialized. 70% of people said their benefits have stayed about the same. 12% said their benefits have actually decreased. Only 16% of people polled said they have better benefits now than before Obamacare. To put Obamacare in a less unsavory light, NPR led that story by combining the figures for those who said the ACA ‘has had no effect’ with those who said ‘better,’ which, of course, defies logic. When Democrats committed the federal government to spending trillions of dollars on ObamaCare, it presumably wasn’t to keep things the same. Although with the way this crowd in Washington — Democrats and Republicans — likes to spend our tax dollars, who knows? Affordable Care Act, Health Care, National Public Radio, NPR, Obamacare, Robert Wood Johnson Foundation. Bookmark.